"This sheet is a finished design for a print. 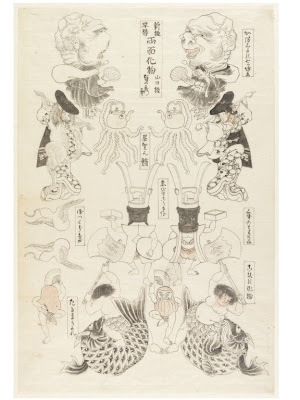 It is full of images of monsters depicted from two sides. 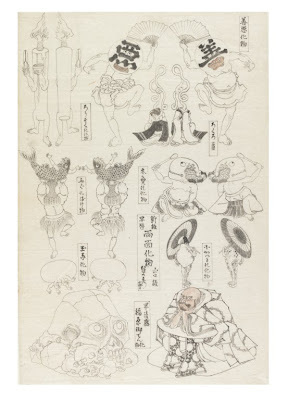 In this sheet, for example, the figures in the top right and left are two sides of the same monster: one side is of his guise as a man (Genkurô) and the other as a fox. Both figures have the same outline, but in reverse. People would cut out the figures, glue them back-to-back and play with them. For this reason, prints of this type are extremely rare. Sadahide's images are full of humour. 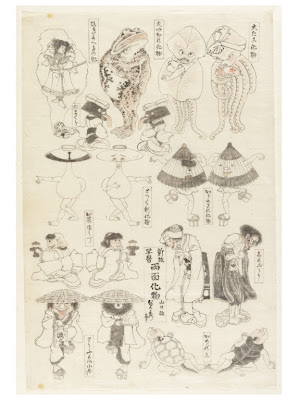 The word for 'monster' in Japanese means literally 'things that change' (bakemono): the theme is perfectly suited to the format." The works are dated between 1830-1844. 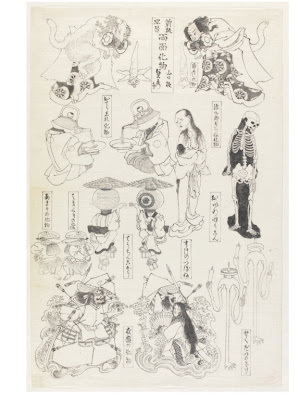 Images found at the Victoria and Albert Museum website. Those were extraordinary! Thank you for posting them.